The strategy is the result of hard experience, according to Google officials. Introduced to much fanfare in 2013, paid channels never really caught on with users. Nor did YouTube’s Tip Jar, introduced a year later. The same lesson was learned again with Music Key, a $9.99 service dedicated to ad-free music videos that could be played in background mode while doing other things, which never made it out of beta. The problem was, the strategy behind Music Key and paid channels was at odds with how people use YouTube, and did not play to its strengths, which are, in order: scale, ubiquity, scale, the rich variety of content on the platform, scale, searchability, scale and scale. YouTube Red is designed to leverage Google’s scale. For $10 a month you can have ad-free access to whatever you want: cat videos, gaming videos, music videos, audio-only on-demand streaming or kids programming. Starting next year, subscribers will also have access to exclusive original movies and TV content produced by some of YouTube’s most popular home-grown stars, including PewDiePie, The Fine Brothers and Lilly Singh. Google’s all-of-the-above strategy will also enable it to leverage its strength in particular verticals to gain traction elsewhere. Google Play Music, for instance, currently is an also-ran in the music streaming game. But YouTube is one of the most widely used music streaming platforms in the world, particularly among Millennials, and a critical source of music discovery thanks to its easy searchability and the ability to embed YouTube music videos on other social media platforms. Users attracted to an ad-free version of their current experience with YouTube music videos will now also be able to take advantage of Google Play Music’s audio-only streaming and download service at no additional cost. Contrast that with Apple Music. While off to a decent start with 6.5 million paid users after three months, according to CEO Tim Cook, it doesn’t particularly play to Apple’s strengths. Apple’s super power is the tight integration of devices and services to create an experience that is easy and intuitive to use, simplifies what was previously complicated, and provides a reason to keep buying Apple devices. While not a bad product in itself, Apple Music doesn’t really do anything that Spotify doesn’t do, and Spotify does some things Apple Music does not — like offer free streaming. 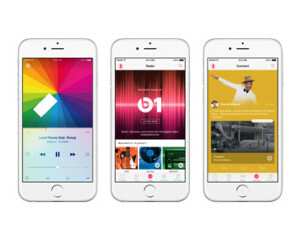 The experience of using Apple Music and an iPhone, moreover, is not greatly differentiated from using Spotify on an iPhone in terms of functionality, ease of use or content selection. Apple is betting heavily on its human-curated playlists to distinguish Apple Music from Spotify and other more alogorithmically oriented services, but that’s a feature aimed at connoisseurs, not the mass of users — not even the mass of Apple users. So far, at least, Spotify seems unaffected by the rollout of Apple Music. In a striking and perhaps telling coincidence, in fact, the same week Tim Cook announced that Apple Music had reached 6.5 million subscribers, Spotify’s app landed at No. 1 in the Top Grossing chart in the iTunes App Store for the first time. Spotify too, of course, along with other dedicated music streaming services, will also have to cope with new competition from YouTube Red. But they at least are playing to their strengths insofar as they were designed for streaming music. Google’s biggest advantage over Apple Music and rest, however, is that it doesn’t need to compete with them directly in the fraught realm of music streaming to be a major player in music streaming. It’s already a major player in ad-supported music streaming simply by virtue of how its users already use the platform. If YouTube can convert even a small fraction of its immense global user base into paying subscribers — for whatever reason — it will by definition become a major player in paid music streaming, simply by virtue of how its users already use the platform.